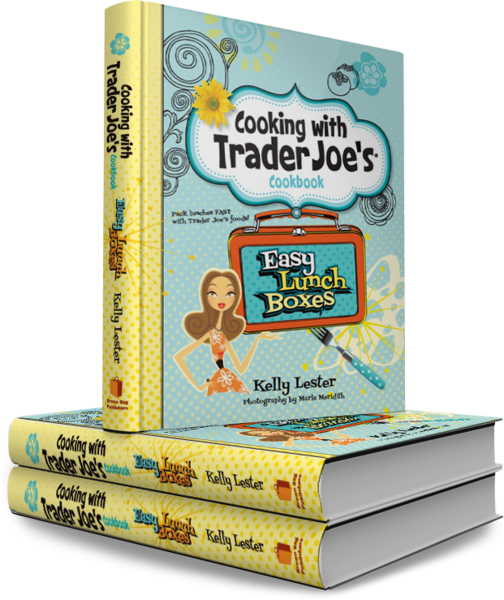 Biting The Hand That Feeds You: Cooking With Trader Joe's - Easy Lunch Boxes - AND ME! Cooking With Trader Joe's - Easy Lunch Boxes - AND ME! Perhaps you weren't aware, but I happened to be a contributor in a collaborative cookbook by Kelly Lester, featuring Trader Joe's foods and EasyLunchboxes. Probably because everyone else submitted "real" recipes, I even got an ENTIRE CATEGORY all to myself! I am the entire Snacks chapter, pages 118-127. 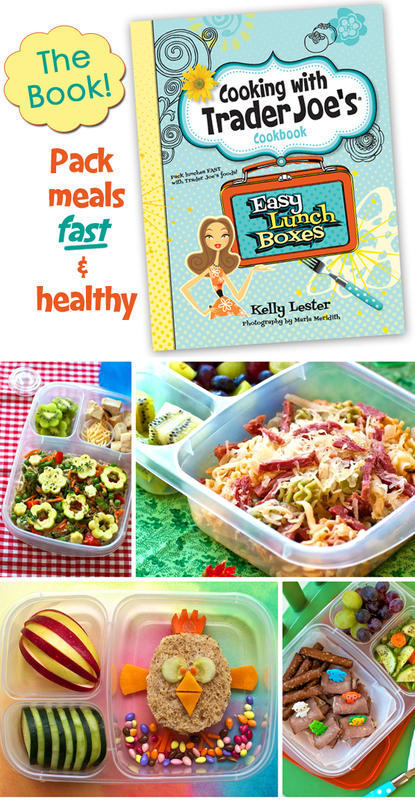 The idea behind this cookbook is to show how easy it is to pack healthy meals to go, no matter what lunchbox system you use. But choosing yummy pre-made options and all-natural ingredients from Trader Joe's helps make it healthier and easier! And using the EasyLunchbox system helps you pack a variety of options for your meal on the go, without having to worry about foods getting soggy or needing to keep track of multiple containers and lids to keep them separate. There are cute kid-friendly meal ideas, grown-up meal ideas, vegetarian and vegan recipes, gluten free recipes, snack ideas (woop woop!) 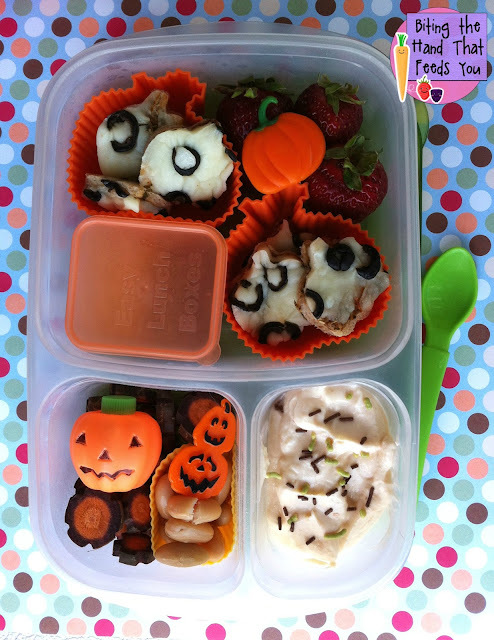 fun facts, lunch packing tips, and more! Even the most incompetent cook (ie: me) can incorporate these recipes and menu ideas into their meals-on-the-go. My favorite one is "Naan Ham Pizza" (page 160) from Emily at Bentobloggy. (My favorite by someone else, that is. Obviously MY recipes are my FAVORITES!) The genius of this one is that I don't have to mess with making or rolling out dough. I changed it up a bit, as Z prefers olives on her pizza. And since we were headed to a pumpkin patch with her class, I made the Naan Pizza into little "bites" using a mini pumpkin cutter! And can I just say - pizza on Trader Joe's frozen Garlic Naan Bread is amazeballs! Yum! If you want the recipe and directions though, you'll need to buy the book! Cooking With Trader Joe's Easy Lunch Boxes cookbook is available at Barnes and Noble or on Amazon! Love the review, I had no idea you were in a cookbook! ;-P The pizza bites look delish, although I'd have to swap the olives for something else, I guess I've passed my feelings about them onto Samuel *shudders*! Love your review - I just bought 5 copies, they'll make great Christmas gifts! Well done! I thought you were just doing one recipe, so congrats on doing a whole section!